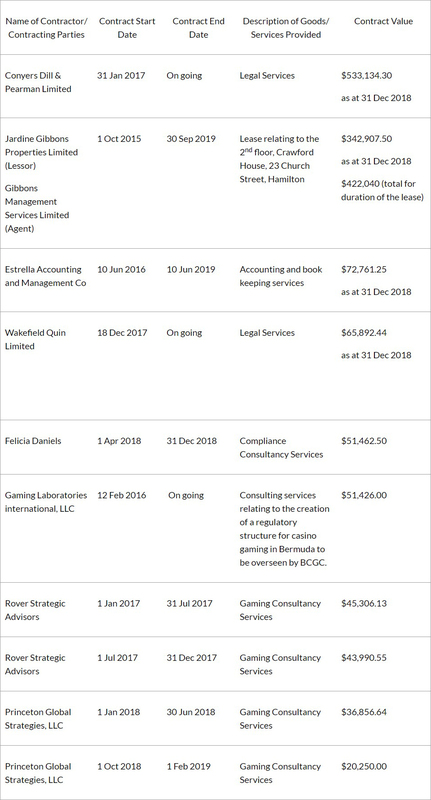 The latest official notices detail some of the expenses of the Bermuda Casino Gaming Commission, with the notices, published pursuant to PATI requirements, providing information on contracts valued at $50,000 or more. Some of those listed include $533,134.30 for Conyers Dill & Pearman, $65,892.44 for Wakefield Quin, as well as payments to entities including Gaming Laboratories International, Rover Strategic Advisors and Rover Strategic Advisors. The Casino Gaming Act passed back in 2014, and multiple attempts to get an update or further information on the current status and expected timing for gaming to come to fruition have been unsuccessful. Also in the interests of full disclosure, who attended Davos in Switzerland this week representing Bermuda? Spend! Spend! Spend! That is all this government is capable of. Bermuda, we need to all stop paying taxes to this government until they start to use the funds responsibly. They have made it impossible to make ends meet yet plan to increase and add even more taxes. This is unjust for the people of Bermuda. When will it stop?